According to Dr. Jean Dodds, author of "The Canine Thyroid Epidemic", Hypothyrodism is the most common endocrine disease of dogs. Of all the diseases that boxers can get, hypothyroidism is the easiest to treat. Hypothyroidism is the most common endocrine disease in all dogs. The thyroid gland controls the speed of metabolism of almost all body cells. When the thyroid produces lower-than-normal levels of hormones, many bodily systems can be affected. The typical clinical symptoms of hypothyroidism include weight gain, sluggishness, ear inflammation, weakness, cold intolerance, and infertility. Skin and coat problems are also common, including hair loss, thickening of the skin, pruritus (itchy skin), pyoderma (inflammation of skin with pus-filled lesions), hyperpigmentation (skin turns very dark), and crusty, flaky skin. 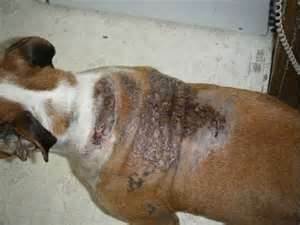 Many boxer owners have found that sudden displays of aggression are an early sign of thyroid disease. In performance dogs, thyroid disease is often marked by sudden confusion when asked to perform well-known tasks. A thyroid panel to determine whether the body chemistry of an individual dog has the major elements associated with thyroid disease, specifically with the form known as autoimmune thyroiditis. This makes it important to test breeding dogs in order to reduce the incidence of thyroid disease. Because hypothyroidism affects the body's metabolism and all internal organs, leaving the condition untreated means sentencing your boxer to a substandard level of existence. Autoimmune thyroiditis generally responds well to Soloxine, which your regular veterinarian can prescribe for your boxer. It is an inexpensive treatment that is easy to administer. Soloxine binds to calcium so should not be given with food. Gentry Boxers conducts annual full thyroid panels on our dogs and results are published on this website and with the OFA. The only lab that I recommend is Hemopet. It is owned by Dr. Jean Dodds, the undisputed expert in canine thyroid issues and author of the book "The Canine Thyroid Epidemic". We have now had experience supporting a boxer with hypothyroid screening results. Early screening is very important, as preventive support therapies are available that can potentially prevent the need for lifelong artificial thyroid supplementation. Our traditional veterinarian advised us to "wait until her thyroid isn't working any more and then give her thyroxin", and we made the mistake of following this advice for about a year until another veterinarian intercepted and told us that this was not correct. Support for a hypothyroid boxer has not been difficult for us, although people have varied experiences. We give our hypothyroid boxer a tiny pill called "Soloxine" twice a day. They are quite inexpensive and she has never been symptomatic. However, we also support her thyroid health holistically with regular liver cleanses (detoxing), raw diet, and dietary supplementation of GreenMin (minerals) and Soul Food (organic vitamins), along with Thyro-Pet Herbal Supplement by PetAlive. I do NOT recommend taking your vet to a general practitioner veterinarian for routine thyroid screens for breeding dogs. They will typically run only T3/T4, which is not sufficient information. You need the full Thyroid 5 panel run and an interpretation from an expert. If you take your dog to your regular vet, they will typically send the serum to Texas A&M or another OFA lab, and you will get a little line with a dot on it showing "in or out of range"; nothing more. And you will pay the markup for running it through your vet. If you are able to draw blood and spin it down to serum, do so and send it to Hemopet. If you don't have the skills/equipment to do this, take your dog to the vet with the OFA Thyroid Form, have them scan your dog's microchip for verification of postiive ID on the OFA form, draw blood and give you about 2-3 cc of serum. This takes about 8cc of whole blood. Have them follow the instructions for prepping the serum on the Hemopet site. Order the OFA Expanded Thyroid Profile. If you mail the serum in to Hemopet yourself, it will be more economical and you can have them email you (and your vet) the results, which you will typically receive in a few days.